Accent Awnings Asheville, NC – Types of Awnings – Accent Awnings, Inc.
Awnings provide protection and shade for any residential and commercial building from the sun. They also add visual appeal to a building or patio and provide a unique space for attention-grabbing signage. While the traditional basic awning types, such as the shed type and dome type, may be most common, there are also other types that may be a better fit for your needs. Based on more basic convex awning styles, this elongated awning is the perfect choice to turn a storefront into a focal point. The awning can run the full length of a building, while the dormer-style design at the center of the awning draws attention to the main entrance of your business. The rounded marquee-style awning pairs the popular rounded style of a dome-type awning with a flat front face. Unlike dome awnings, where text on the front of the awning can be distorted by the curved frame, the rounded marquee’s shape provides the ideal space to display commercial or residential signs. This attractive awning style proves that details can make all the difference in looks. Though based on the far more traditional and common dome awning, the addition of a valance gives the awning a much more unique and polished look. The thin rectangle shape of the sign box awning does not provide much additional protection from elements, but it does make up for this in style. The flat face of the awning fabrics make it a great place for a prominent display of a company name. Whether you want to add a more grand entrance appeal or extend the front of your building closer to passersby, a rounded entrance canopy is the ideal option. These awning types reach out from the building, providing not only the perfect place for signs but also a longer covered walkway for guests. Named for its easily recognizable geometric frame, as well as its similarity to cabana tents that are often found on the beach, this custom awning is sure to catch more glances than more traditional awnings. Used for a restaurant or cafe, these canopies make the perfect covering for comfortable patio or porch seating. This truly great awning is most like a dome-type awning if the down awning were turned sideways. With its rounded shape and horizontal rather than vertical panels, the Florentine awning is a great stand-out feature for highlighting smaller doors, a window, or main entrance that could otherwise go unnoticed on a busy street. A retractable awning is ideal if you want to show off the lines of the property but would appreciate some cover during a downpour. Manual and motorized versions make it easy to roll out a retractable awning during the worst weather or to get some shade. You can also retract the awning during heavy winds to help avoid damaging the canvas. The only downside to a retractable awning is the required maintenance. Moving parts mean it is more likely to break down and need a repair. A traditional awning extends from permanent structures to provide protection and shade from the sun and weather. These unsupported versions allow you to put a roof on an outdoor space, such as a covered patio. Materials range from durable fabrics to aluminum structures, and each canopy can be custom built to fit a variety of structures. Keep in mind that freestanding canopies have four open sides, so they don’t offer as much shade as an awning installed on a building. Small, residential awnings for windows can match almost any decor. You can find metal options with wrought iron accents or wooden slat designs that look great with cottage-style homes. Dome shapes bring to mind the 1950s, and these awnings are perfect for a throwback look. You can also spruce them up with modern color choices and interesting patterns. Many are available with a stiff fabric canopy, so anything you can print on fabric can go on your awning. Traditional awnings have a straight slope, but concave awnings curve in. The ultra-modern look of these awnings is a nice touch on new construction, but the shape does have a few downsides: the inward curve acts like a bowl, allowing rain and snow to collect on the awning. If you install one, make sure there is appropriate drainage to avoid issues with water. These awnings have a long straight slope set out from the building, much like a rectangle with one side partially cut. They have all the weather-resistant properties of a traditional awning, but casement awnings let you build them wider without worrying about height. These awnings are excellent when you want to protect shutters but but need natural light. They lie flat against the window in inclement weather to provide additional protection and lift away from the building in nice weather to allow extra light and air flow. From the sign box to the pyramid cabana, all types of awnings bring a different flavor to the front of a building. Regardless of the buyer’s taste and needs, these types are sure to offer something to complement and even accentuate any area. 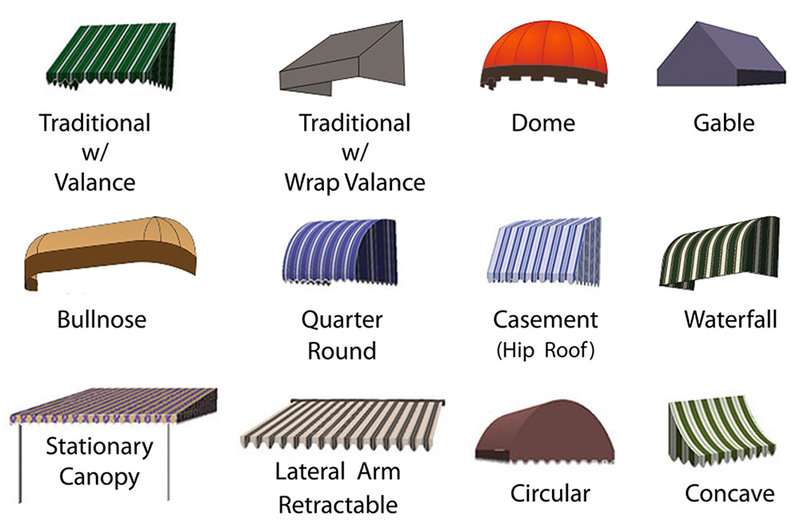 If you want to know more about types of awnings you can get, contact Accent Awnings.